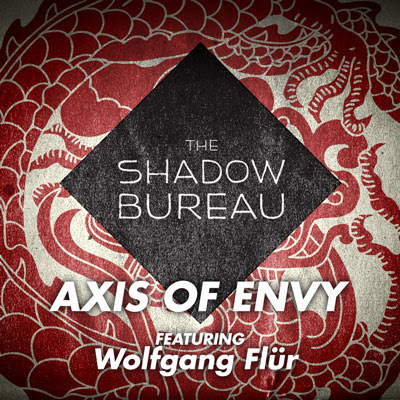 The Shadow Bureau “Axis of Envy” hits iTunes! Time to equip your iPods, Smartphones, and playlists with some seriously awesome industrial electronica! The killer track from Shadow Bureau entitled “The Axis of Envy” is now on iTunes, so download it here now. Shadow Bureau is the musical brainchild led by award winning composer, producer, singer/song writer and multi-instrumentalist Bon Harris, who is most famous for his electronic and production collaborations with Depeche Mode, The Smashing Pumpkins, Evanescence, AFI, Marilyn Manson, Avril Lavigne, Bush, and Billy Corgan’s solo projects. “Axis of Envy” is a musical collaboration between Harris and the iconic Wolfgang Flür, a former member of the pioneering and highly-influential German electronic rock band Kraftwerk.